So, tonight I was out in Encinitas, CA (North county San Diego.) I was standing in an interminable line for The Daley Double Saloon, which is entirely too popular for no apparent reason. 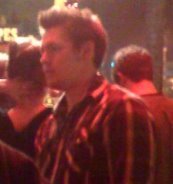 Anyway, I was behind Scott Clifton and his girlfriend Nikki. Scott played Dillon Quartermaine on General Hospital. Scott: Oh my God, I would totally tell you everything. You know that. I think you’re fantastic. Nikki: I know, but what happened with [the ex.]? Scott proceeds to tell this rambling story about email drama with an ex girlfriend. Nikki: But you’ve never told me any of this before! Why is this the first time I’m hearing about this?!? More drama ensues, followed by making up and lots of kissing and hugging in line. Eventually I got into the bar… not a moment too soon. Soap-opera-like drama is better on the screen than it is on the street. 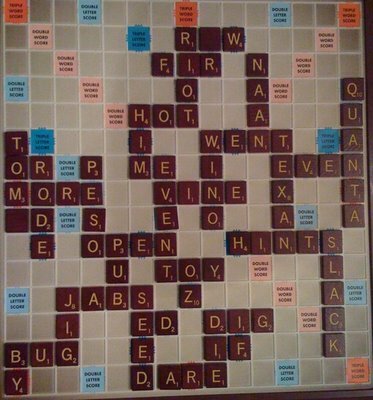 This Thanksgiving, in addition to being thankful for all the love & support from family and friends, and all the good food, and my good health, I am thankful for winning 2 Scrabble games. I used to get beat practically every single game that I played. It got to the point where it just wasn’t fun any more. But I dusted off the board and gave it another try. Anyway, I enjoyed breaking my losing streak. Here’s a photo of the board. Inspiration for a Drag Queen? I finally got my schedule straightened out a bit, cleared some of my to-do list, and hit the gym. I’m not a pixie-chick, so I don’t use the pink weights. After a little aerobics warm up, I put on Marilyn Manson on my iPhone/iPod, kicked off my sneakers and hit the weights – hard. My warm up set of squats was 75lbs. I don’t have a lot of upper body strength, but I’m still not a wimp… so I did some overhead presses with 20lb dumbbells. Then I noticed something odd: someone was copying me! I honestly couldn’t figure out if the person copying my workout was a man or a woman. Seriously, it was a toss up. No real figure, some makeup, a small frame, large-ish hands for a woman, but small hands for a guy. My inclination is that this was a man, but I wouldn’t think that a drag queen would be particularly interested in weight training. I always knew that my general fabulousness was inspirational, but I guess I need to consider my workouts as inspiration for the Lips crewe! I saw a book review from Wired magazine that hooked me and reeled me in. The wired article interview had a very provocative statement. One of the authors of the book considers testosterone to be the perfect weapon of mass destruction. Ha! OK, my interest is piqued. I gotta get this book. There are sales in every single clothing store. Everything is on sale. Even current-season clothes are discounted. It’s kinda interesting how desperate the stores are to move merchandise. I went to a breast cancer fundraiser last night at a local bar. It had a funny title: Blackout for Boobies. I listened to NPR all the way up to Santa Ana. No interruptions. I got to work, sat down, and clickety-clack-clack on the keyboard for hours with no interruption. Finally, it dawned on me that maybe something was missing. Turns out it was my phone. Oops. It’s kinda funny how much I’ve gotten in the “let’s do lunch” mode with business associates and friends. So far, it hasn’t taken too much of a toll on my waistline… but I have to watch it. You are currently browsing the Lura.net Blog archives for November, 2008.